When Volkswagen rolled out the all new 2010 Polo last March in Geneva, the automaker also showed a revamped BlueMotion version as a concept. 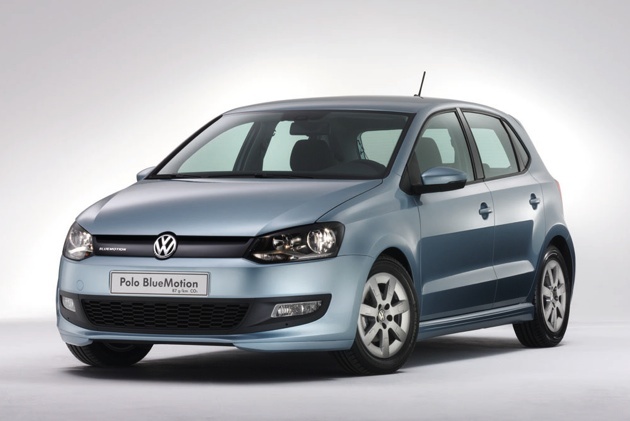 That updated Polo BlueMotion is now available for order in European markets. The new high-efficiency Polo is powered by a new 1.2-liter three cylinder TDI diesel that is essentially the 1.6-liter Golf engine with one cylinder lopped off the end. The diesel triple is rated at 73.8 hp, which helps contribute to the 22 percent drop in fuel consumption compared to the last Polo BlueMotion. Like other BlueMotion models, the Polo is highly optimized for maximum efficiency including features like auto start-stop, brake energy regeneration and aerodynamic tweaks. The result is a non-hybrid car that is rated at 71.3 mpg (U.S.) on the EU combined driving cycle. That's up from 56 mpg on the old model. The CO2 emissions are down from 109 g/km to just 87 g/km. Volkswagen begins taking orders for new Polo BlueMotion in Europe originally appeared on Autoblog Green on Mon, 14 Dec 2009 16:03:00 EST. Please see our terms for use of feeds. 0 comments on "Volkswagen begins taking orders for new Polo BlueMotion in Europe"